Trevor Ratcliffe Deliveries Limited (Ratcliffe) provides a range of services for the collection of scrap metal working with businesses, households and local organisations. We provide everything from Skip drops to onsite collection with Moffetts, Grabs or Skilages. Scrap metal is classified as either ferrous or non-ferrous metal. While ferrous metal contains some degree of iron non-ferrous metal does not contain iron as a component. Common non-ferrous metals are copper, brass, aluminum, zinc, magnesium, tin, nickel, and lead. 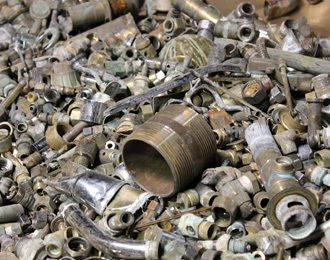 Scrap metal can be further categorized as obsolete or prompt scrap. Sources of obsolete ferrous scrap include cars, steel structures, household appliances, farm equipment as well as other sources. Prompt scrap, which is generated as a by-product of industrial and manufacturing activities, accounts for approximately half of the ferrous scrap supply. According to research recycling scrap metals is very beneficial to the environment. Using recycled scrap metal in place of virgin iron ore can yield. Contact Trevor Ratcliffe to discuss our scrap metal services.